Think about the last time you took an online assessment or used a web-based calculator. You were probably engaged and learned something useful. It was an “experience,” right? 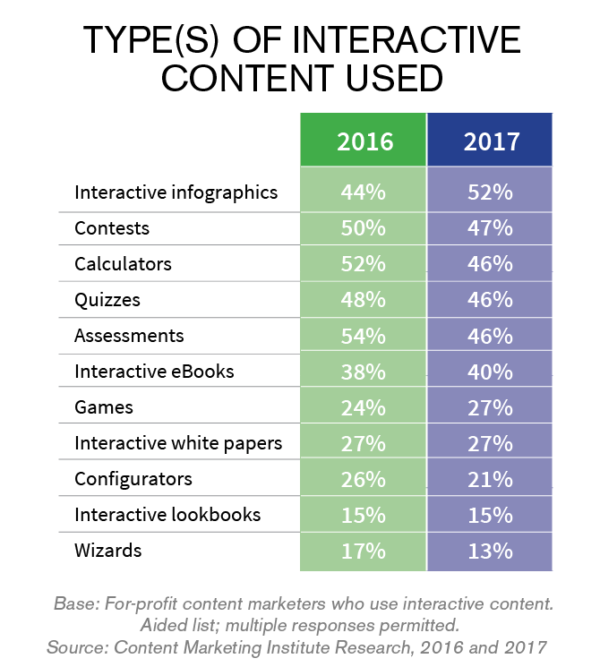 According to Content Marketing Institute’s latest research, nearly half (46%) of marketers surveyed are using interactive content. Their top reason for doing so? Engagement – followed by educating the audience, creating brand awareness, and lead generation. 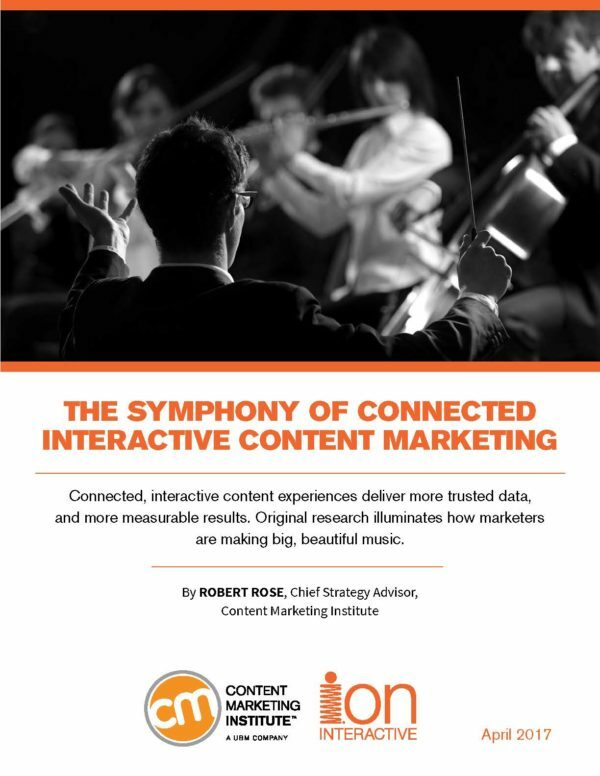 Here are some other key findings from CMI’s white paper, The Symphony of Connected Interactive Content Marketing, sponsored by ion interactive. The paper presents the results of a survey CMI conducted in January and February 2017. We conducted the same survey in 2016, so the paper explores how some things have changed over the last year and includes guidance for using interactive content for content marketing purposes. More than half of the respondents (55%) report that they’ve been using interactive content for fewer than three years (versus 47% last year), indicating more new entrants in the survey. These newer users indicate that 13% of the total content they produce, on average, is interactive. 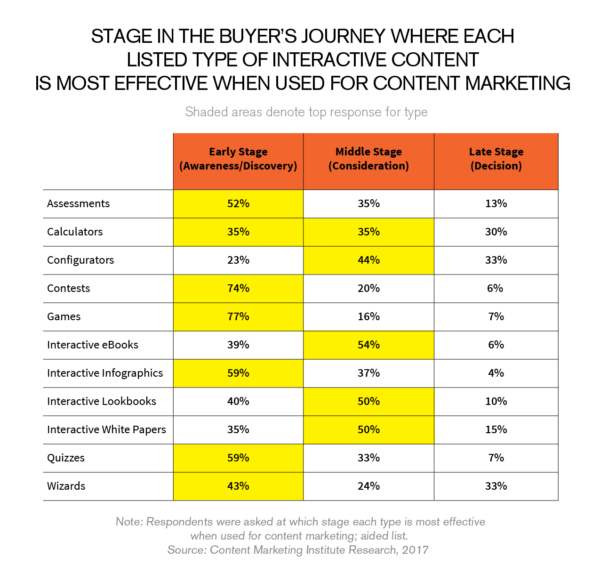 The longer a company has been producing interactive content, the more likely it is to produce more: Those with three or more years of doing so say that interactive content on average comprises 24% of the total content they produce. 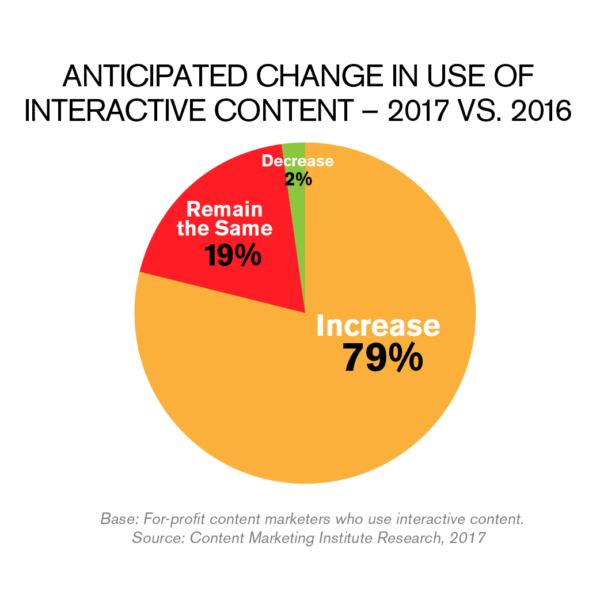 Furthermore, the use of interactive content will continue to rise: 79% of those that use it say they plan to increase their use in the next 12 months (last year, 75% said they anticipated an increase). What types of interactive content are they using? The most-used type of interactive content is infographics (52%), which also displays the highest growth in usage (18%) over the last year. Interactive infographics were followed by contests (which rated as the most effective type), calculators, quizzes, and assessments. Games (77%) were rated most effective in the early stage (awareness/discovery). Interactive e-books (54%) were rated most effective in the middle stage (consideration). Configurators and wizards (tied at 33%) were rated most effective in the late stage (decision). Are you using interactive content? If so, how’s it going? If not, why? Let us know in the comments. To glean more insight from this and other CMI original research, visit our custom research page. Lisa Murton Beets is Content Marketing Institute's research director. She oversees all aspects of our annual content marketing survey, as well as the reports we publish based on the findings. Lisa also works with CMI’s consulting/advisory and sales teams to develop and report on custom research surveys. Follow her @LisaBeets.